October 31, 1950 Earl Francis “Big Cat” Lloyd became the first African American to play in a National Basketball Association game. Lloyd was born April 3, 1928 in Alexandria, Virginia. He played collegiate basketball at West Virginia State College where he was a two-time All-American and earned his Bachelor of Science degree in physical education in 1950. 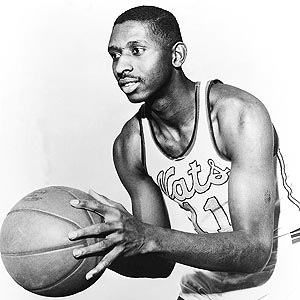 He was selected by the Washington Capitols in the 1950 NBA Draft and played professionally for nine seasons, retiring in 1960. From 1972 to 1973, he coached the Detroit Pistons and then served as a scout for five seasons with the team. In 2003, Lloyd was inducted into the Naismith Memorial Basketball Hall of Fame as a contributor and the basketball court at T. C. Williams High School in his hometown is named in his honor. His autobiography, “Moonfixer: The Basketball Journey of Earl Lloyd,” was published in 2009.